Following a question as to whether there was a Primitive Methodist equivalent of the JMA medal. I am pleased to be able to add some information on the Primitive Missionary Society collectors medals and bars. Martin Bower, who is compiling a catalogue of Methodist medals and medallions, has kindly sent me a picture with permission to use it. As you will see it has the Primitive year bar style for 1931 and the Wesleyan style year bar for 1932 following union. Martin tells me that Englesea Brook have a medal with bars attached for 1926 to 1929 which has object no. ENBPM: 1991.051. If anyone has any further information on the medals and when they started to be awarded I would be most grateful to have the details. 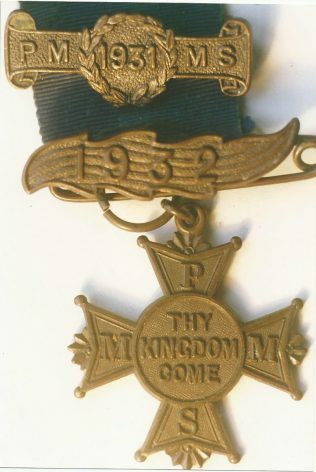 The first Primitive Methodist Missionary Society medal for young collectors was awarded in 1924.